Habit: Annual, perennial herb. Stem: erect. Leaf: basal to cauline; ligule membranous, glabrous to minutely ciliate, toothed at obtuse to truncate tip; blade narrow, flat to inrolled. Inflorescence: panicle-like, generally compact, narrow, or wider in full flower. 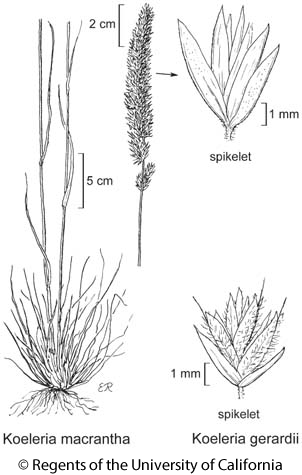 Spikelet: laterally compressed; glumes unequal, upper > and wider than lower, keeled, acute, lower 1-veined, upper faintly 3--5-veined; axis prolonged beyond fertile floret, bristly (occasionally with vestigial floret at tip); florets 2--5, bisexual, breaking above glumes and between florets; lower lemmas generally > glumes, awned or not, 5-veined; palea +- < lemma, tip minutely 2-forked. Stem: 1--6(15), 5--40 cm, glabrous. Leaf: basal and cauline; basal loosely tufted, back and margins soft- to coarse-hairy; ligule < 1 mm; blade 1--5 cm, 1--2 mm wide, smooth to ridged. Inflorescence: 8--30 cm, 4--10 mm wide, cylindric. Spikelet: 3--4 mm, green to tan; lower glume +- 2 mm, upper +- 3 mm; lemma 2--3 mm, awned at tip, lower lemma awn 1--2 mm. Chromosomes: 2n=26. Citation for this treatment: Dieter H. Wilken 2012, Koeleria gerardi, in Jepson Flora Project (eds.) Jepson eFlora, http://ucjeps.berkeley.edu/eflora/eflora_display.php?tid=29957, accessed on April 24, 2019. No expert verified images found for Koeleria gerardi. NCoRI, CaRF, SNF, Teh, GV, s SCoRO, SCoRI, SCo, ChI, w TR; Markers link to CCH specimen records. Yellow markers indicate records that may provide evidence for eFlora range revision or may have georeferencing or identification issues. Purple markers indicate specimens collected from a garden, greenhouse, or other non-wild location.